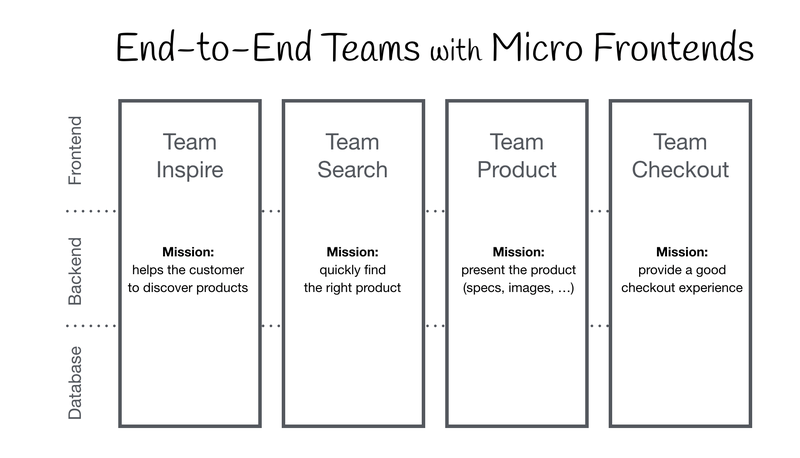 The term Micro Frontends first came up in ThoughtWorks Technology Radar at the end of 2016. It extends the concepts of micro services to the frontend world. The current trend is to build a feature-rich and powerful browser application, aka single page app, which sits on top of a micro service architecture. Over time the frontend layer, often developed by a separate team, grows and gets more difficult to maintain. That’s what we call a Frontend Monolith. The idea behind Micro Frontends is to think about a website or web app as a composition of features which are owned by independent teams. Each team has a distinct area of business or mission it cares about and specialises in. A team is cross functional and develops its features end-to-end, from database to user interface. However, this idea is not new, in the past it went by the name of Frontend Integration for Verticalised Systems or Self-contained Systems. But Micro Frontends is clearly a more friendly and less bulky term. What’s a Modern Web App? In the introduction I’ve used the phrase “building a modern web app”. Let’s define the assumptions that are connected with this term. To put this into a broader perspective, Aral Balkan has written a blog post about what he calls the Documents‐to‐Applications Continuum. He comes up with the concept of a sliding scale where a site, built out of static documents, connected via links, is on the left end and a pure behaviour driven, contentless application like an online photo editor is on the right. If you would position your project on the left side of this spectrum, an integration on webserver level is a good fit. With this model a server collects and concatenates HTML strings from all components that make up the page requested by the user. Updates are done by reloading the page from the server or replacing parts of it via ajax. Gustaf Nilsson Kotte has written a comprehensive article on this topic. When your user interface has to provide instant feedback, even on unreliable connections, a pure server rendered site is not sufficient anymore. To implement techniques like Optimistic UI or Skeleton Screens you need to be able to also update your UI on the device itself. Google’s term Progressive Web Apps aptly describes the balancing act of being a good citizen of the web (progressive enhancement) while also providing app-like performance. This kind of application is located somewhere around the middle of the site-app-continuum. Here a solely server based solution is not sufficient anymore. We have to move the integration into the browser, and this is the focus of this article. Each team should be able to choose and upgrade their stack without having to coordinate with other teams. Custom Elements are a great way to hide implementation details while providing a neutral interface to others. Don’t share a runtime, even if all teams use the same framework. Build independent apps that are self contained. Don’t rely on shared state or global variables. Agree on naming conventions where isolation is not possible yet. Namespace CSS, Events, Local Storage and Cookies to avoid collisions and clarify ownership. Use Browser Events for communication instead of building a global PubSub system. If you really have to build a cross team API, try keeping it as simple as possible. Custom Elements, the interoperability aspect from the Web Components Spec, are a good primitive for integration in the browser. Each team builds their component using their web technology of choice and wraps it inside a Custom Element (e.g. <order-minicart></order-minicart>). The DOM specification of this particular element (tag-name, attributes & events) acts as the contract or public API for other teams. The advantage is that they can use the component and its functionality without having to know the implementation. They just have to be able to interact with the DOM. But Custom Elements alone are not the solution to all our needs. To address progressive enhancement, universal rendering or routing we need additional pieces of software. This page is divided into two main areas. First we will discuss Page Composition - how to assemble a page out of components owned by different teams. After that we’ll show examples for implementing clientside Page Transition. Beside the client- and serverside integration of code written in different frameworks itself, there are a lot of side topics that should be discussed: mechanisms to isolate js, avoid css conflicts, load resources as needed, share common resources between teams, handle data fetching and think about good loading states for the user. We’ll go into these topics one step at a time. 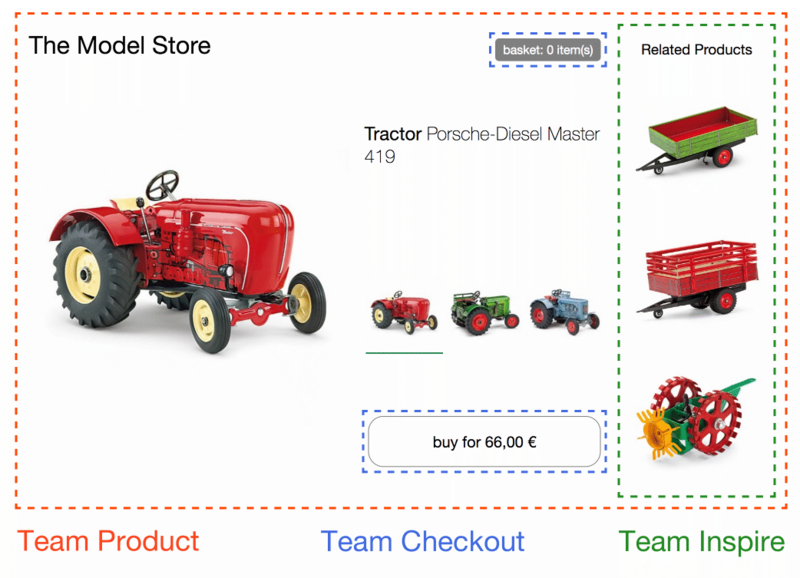 The product page of this model tractor store will serve as the basis for the following examples. It features a variant selector to switch between the three different tractor models. On change product image, name, price and recommendations are updated. There is also a buy button, which adds the selected variant to the basket and a mini basket at the top that updates accordingly. In this example, the page is split into separate components/fragments owned by three teams. Team Checkout (blue) is now responsible for everything regarding the purchasing process - namely the buy button and mini basket. Team Inspire (green) manages the product recommendations on this page. The page itself is owned by Team Product (red). Team Product decides which functionality is included and where it is positioned in the layout. The page contains information that can be provided by Team Product itself, like the product name, image and the available variants. But it also includes fragments (Custom Elements) from the other teams. How to Create a Custom Element? Lets take the buy button as an example. Team Product includes the button simply adding <blue-buy sku="t_porsche"></blue-buy> to the desired position in the markup. For this to work, Team Checkout has to register the element blue-buy on the page. Now every time the browser comes across a new blue-buy tag, the constructor is called. this is the reference to the root DOM node of the custom element. All properties and methods of a standard DOM element like innerHTML or getAttribute() can be used. When naming your element the only requirement the spec defines is that the name must include a dash (-) to maintain compatibility with upcoming new HTML tags. In the upcoming examples the naming convention [team_color]-[feature] is used. The team namespace guards against collisions and this way the ownership of a feature becomes obvious, simply by looking at the DOM. When the user selects another tractor in the variant selector, the buy button has to be updated accordingly. To achieve this Team Product can simply remove the existing element from the DOM and insert a new one. The disconnectedCallback of the old element gets invoked synchronously to provide the element with the chance to clean up things like event listeners. After that the constructor of the newly created t_fendt element is called. Another more performant option is to just update the sku attribute on the existing element. If Team Product used a templating engine that features DOM diffing, like React, this would be done by the algorithm automatically. To support this the Custom Element can implement the attributeChangedCallback and specify a list of observedAttributes for which this callback should be triggered. To avoid duplication a render() method is introduced which is called from constructor and attributeChangedCallback. This method collects needed data and innerHTML’s the new markup. When deciding to go with a more sophisticated templating engine or framework inside the Custom Element, this is the place where its initialisation code would go. The above example uses the Custom Element V1 Spec which is currently supported in Chrome, Safari and Opera. But with document-register-element a lightweight and battle-tested polyfill is available to make this work in all browsers. Under the hood, it uses the widely supported Mutation Observer API, so there is no hacky DOM tree watching going on in the background. But passing down attributes is not sufficient for all interactions. In our example the mini basket should refresh when the user performs a click on the buy button. The mini basket can now subscribe to this event on window and get notified when it should refresh its data. With this approach the mini basket fragment adds a listener to a DOM element which is outside its scope (window). This should be ok for many applications, but if you are uncomfortable with this you could also implement an approach where the page itself (Team Product) listens to the event and notifies the mini basket by calling refresh() on the DOM element. Imperatively calling DOM methods is quite uncommon, but can be found in video element api for example. If possible the use of the declarative approach (attribute change) should be preferred. To make server rendering work, the previous example is refactored. Each team has their own express server and the render() method of the Custom Element is also accessible via url. The #include comment is part of Server Side Includes, which is a feature that is available in most web servers. Yes, it’s the same technique used back in the days to embed the current date on our web sites. There are also a few alternative techniques like ESI, nodesi, compoxure and tailor, but for our projects SSI has proven itself as a simple and incredibly stable solution. The directive ssi: on; enables the SSI feature and an upstream and location block is added for every team to ensure that all urls which start with /blue will be routed to the correct application (team_blue:3001). In addition the / route is mapped to team red, which is controlling the homepage / product page. The variant selection buttons now are actual links and every click leads to a reload of the page. The terminal on the right illustrates the process of how a request for a page is routed to team red, which controls the product page and after that the markup is supplemented by the fragments from team blue and green. You can play with this sample code on your local machine. Only Docker Compose needs to be installed. The src files are mapped into the individual containers and the node application will restart when you make a code change. Changing the nginx.conf requires a restart of docker-compose in order to have an effect. So feel free to fiddle around and give feedback. A downside of the SSI/ESI approach is, that the slowest fragment determines the response time of the whole page. So it’s good when the response of a fragment can be cached. For fragments that are expensive to produce and hard to cache it’s often a good idea to exclude them from the initial render. They can be loaded asynchronously in the browser. In our example the green-recos fragment, that shows personalized recommendations is a candidate for this. One possible solution would be that team red just skips the SSI Include. Important Side-note: Custom Elements cannot be self-closing, so writing <green-recos sku="t_porsche" /> would not work correctly. There are different options to avoid an annoying reflow like this. Team red, which controls the page, could fixate the recommendation containers height. On a responsive website its often tricky to determine the height, because it could differ for different screen sizes. But the more important issue is, that this kind of inter-team agreement creates a tight coupling between team red and green. If team green wants to introduce an additional sub-headline in the reco element, it would have to coordinate with team red on the new height. Both teams would have to rollout their changes simultaneously to avoid a broken layout. A better way is to use a technique called Skeleton Screens. Team red leaves the green-recos SSI Include in the markup. In addition team green changes the server-side render method of its fragment so that it produces a schematic version of the content. The skeleton markup can reuse parts of the real content’s layout styles. This way it reserves the needed space and the fill-in of the actual content does not lead to a jump. Skeleton screens are also very useful for client rendering. When your custom element is inserted into the DOM due to a user action it could instantly render the skeleton until the data it needs from the server has arrived. Even on an attribute change like for the variant select you can decide to switch to skeleton view until the new data arrives. This ways the user gets an indication that something is going on in the fragment. But when your endpoint responds quickly a short skeleton flicker between the old and new data could also be annoying. Preserving the old data or using intelligent timeouts can help. So use this technique wisely and try to get user feedback. This store is developed by two teams using the here described techniques. Posts: Cookie Cutter Scaling David Hammet wrote a series of blog posts on this topic. Wikipedia: Java Portlet Specification Specification that addresses similar topics for building enterprise portals. Michael Geers (@naltatis) is a software engineer at neuland Büro für Informatik and works on building nice frontends for e-commerce. Koike Takayuki who translated the site to Japanese. This site is generated by Github Pages. Its source can be found at neuland/micro-frontends.